The all new Avastor XD2 is a professional 2-Bay RAID Enclosure. This unit ships un-populated so you can either use your existing SATA drives or purchase new ones of your choice. 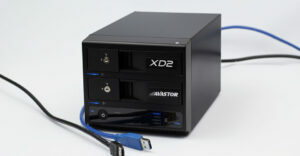 The XD2 has a trayless design allowing you to easily transfer 3.5″ SATA drives in and out of the unit, unlike many other brands of RAID chassis which have propriety “screw in” trays. The USB 3.0 and eSATA interfaces provide you with unsurpassed data transfer performance. 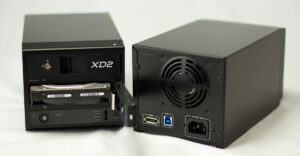 The XD2 is your best choice for a high capacity, high speed, compact RAID solution! The XD2 has been designed with professional content creators in mind. The fast interfaces, the internal power supply and the trayless design all lend to a workflow that professionals need.